First Benghazi and now emails. 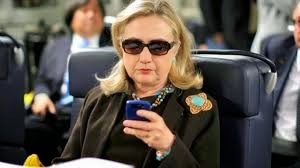 Former first lady and secretary of State Hillary Rodham Clinton is being investigated for using her private email account during her time as the secretary of state instead of the government's official email system. Moreover, she even has a private server in her home in New York which processed and stored the electronic correspondence. Clinton claims she did nothing wrong and wanted to have one email to access all of her correspondence. Republicans are crying foul while the Democrats see this as a smear campaign to hurt the chances of Clinton running in 2016 for the presidency of the United States after Obama leaves office. Clinton's aides and others claim that no laws were broken. However, a document from the government which those who leave office must sign clearly states that all emails and messages must be handed in. Now, it seems Clinton does not have all of her emails despite owning her own server. Republicans have vowed to use the legal process in order to get Clinton to hand the server and other emails over.